“Strange Overtones” is the first single by David Byrne and Brian Eno from their new album Everything That Happens Will Happen Today. “This groove is out of fashion, these beats are twenty years old,” state the lyrics and yes indeed, it has been 20 years since the beat has been self-consciously celebrated during late 20th century electronic dance music revolution brought on by Japanese music machines such as the Roland 808. But the beats (some of them by Robert Wyatt) in this track are actually very intricate and danceable too. Most of the drumming and programming reminds me of “Riot in Lagos“, from B2-Unit, Ryuichi Sakamoto second solo album. This entry was posted in dance, miscellaneity, music on August 19, 2008 by jahsonic. I may have dismissed Philip Sherburne‘s piece on the current state of beats too quickly in my recent comment. As I said in my comment I find it hard to imagine that beats are going out of fashion. Witness these beats set to The Stones‘s “You Can’t Always Get What You Want“ remix by Belgian dance-punkers Soulwax. Listen for the choral arrangements by Jack Nitzsche. Regarding beats going out of fashion from a theoretical point of view. The beat is a celebration of dance, dance is a celebration of hedonism. Hedonism flourishes in economic booms. Today is an era of poverty. Beats do not fit in poverty. Perhaps. But. Counter example one: the beats of Lindy Hop during Depression America. So evidence inconclusive, but if I had to investigate I would follow the economic boom/malaise route. This entry was posted in 1001 things to do before you die, critical theory, culture, dance, decadence, economics, hedonism, life, music, theory, world music classics on July 19, 2008 by jahsonic. Sonny Okosuns (1947 – May 24 2008) was a Nigerian singer and musician. Okosuns first came to international attention with the 1977 composition “Fire in Soweto“. Please listen to “Tire Ni Oluwa”, which is a groovier track. “African Reggae” is WMC #50, this nobrow track appeals to both the punk and the black music crowd and would not be out of place in the German opera category, although probably only for its formal qualities, i.e. the voice of Hagen. The B-side to “African Reggae” was Lucky Number, originally recorded by Lene Lovich , Hagen covered the song the following year. Hagen’s version was spunkier. This entry was posted in 1001 things to do before you die, black music, dance, death, music, world music classics on June 26, 2008 by jahsonic. I seem to have become somewhat of an obituarist. The pantheon of disco DJs lost one of its demigods when Barry Lederer (September 9 1944 – May 31 2008) died earlier this week. Now you may ask, if Lederer was a demigod, who were the true gods in disco-DJ-mythology? Most commonly cited in this category are David Mancuso, François Kevorkian, Larry Levan, Walter Gibbons, Francis Grasso, Nicky Siano, Tom Moulton and Tee Scott. Click the footnotes to hear the music. This entry was posted in American culture, dance, death, music on June 10, 2008 by jahsonic. Donna McGhee is an American singer who released one album on Red Greg Records, produced and arranged by Greg Carmichael and Patrick Adams. The track from that album, “Make It Last Forever,” was covered by Loleatta Holloway. Greg Carmichael (“Barely Breaking Even”) and Patrick Adams (“In the Bush” and “Keep on Jumpin’) produced at least 50 tracks which transcend disco as genre. They are in many ways the auteurs of disco, more so than Larry Levan, Walter Gibbons or Tom Moulton, who were primarily involved in post-production. The only one to rival Adams and Carmichael was Arthur Russell, but his story is altogether different. This entry was posted in 1001 things to do before you die, African American culture, American culture, dance, miscellaneity, music, world music classics on June 1, 2008 by jahsonic. 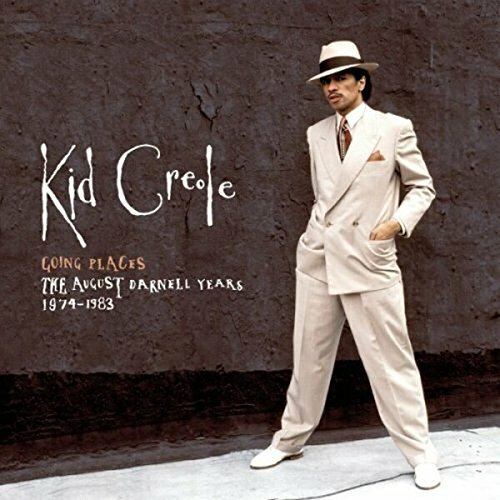 August Darnell aka Kid Creole (Montreal, Canada, 12 August, 1950) is a Canadian musician who has been involved in several dance-oriented projects in New York in the late 1970s and early to mid 1980s. Projects include Dr. Buzzard’s Original Savannah Band (led by Darnell’s brother Stony), Don Armando’s Second Avenue Rhumba Band, Gichy Dan’s Beechwood #9, the “mutant disco” of Aural Exciters and, of course, Kid Creole and the Coconuts, as well as “solo” projects involving Andy “Coati Mundi” Hernandez[2,5], Taana Gardner, Fonda Rae. and Lizzy Mercier Descloux. Some of the more (and less)obscure offerings of Darnell have been released on an music compilation in 2008 by Strut Records as Going Places: The August Darnell Years 1976-1983. Click the number to listen to the tracks, not all tracks are Darnell projects, but also just of the artists mentioned. Fonda Rae in Machine’s “There but for the Grace of God Go I” is world music classic 38, and has an interesting bit of music censorship history behind it, perhaps more on that later. This entry was posted in African American culture, American culture, dance, hedonism, music, underrated, world music classics on May 7, 2008 by jahsonic. “Elle et moi” is a musical composition by Max Berlin, first published in 1978 on the Belgian recording label USA Import. This is the type of track which has survived in popular consciousness through nightclub play rather than radio play. I can’t remember hearing “Elle et Moi” on any commercial radio station. Skilled and knowledgeable DJs usually play “Elle et moi” after or before Gainsbourg’s 1968 Requiem pour un con (YouTube), from the soundtrack to the film Le Pacha. This entry was posted in 1001 things to do before you die, dance, European culture, music on March 17, 2008 by jahsonic. It’s actually strange that I’ve never actively come across this band besides of having heard of them. I am a big fan of Bill Laswell and all P-Funkiana, both are canonical to my encyclopedic work. Praxis introduces a whole collective of adventurous culture, from cutting edge music to exciting graphics, rebellious texts and tetsuoesque performances (is the life-size doll by Rammellzee?). “Animal Behavior” (1992) from the Transmutation (Mutatis Mutandis) album. 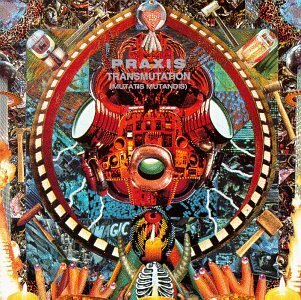 Transmutation (Mutatis Mutandis) is the first album by Bill Laswell‘s everchanging “supergroup” Praxis. This first album features Buckethead on guitar, Bootsy Collins on bass and vocals, Brain on drums, Bernie Worrell on keyboards and DJ AF Next Man Flip on turntables and mixer. This entry was posted in aesthetics, African American culture, American culture, anarchism, art, contemporary art, dance, fantastique, hauntology, miscellaneity, music, postmodernism, subculture, underrated, visual culture on February 12, 2008 by jahsonic.